A couple of months ago, we tested the MSI GS65 Stealth Thin 8RF which proved to be a good option for anyone looking at a genuinely portable high-end gaming laptop. 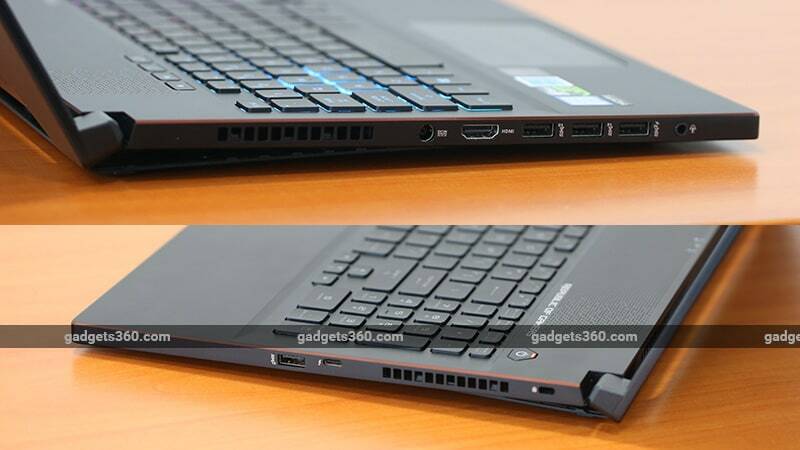 At the time, we mentioned that the Asus Zephyrus M was potentially its biggest competitor. Now that the latter is actually available in India, we have it in for a test. The Zephyrus M, or GM501GS, borrows some of the design principles of the flagship Zephyrus GX501, which makes it a very interesting choice in the high-end segment. Asus is currently selling two variants of it in India, of which we have the higher end one that competes directly with MSI’s offering. Let’s see how it compares to the Stealth Thin, and whether Asus has managed to get the pricing right. The first thing that strikes you when you take this laptop out of its box is the monolithic design. The Zephyrus M looks like a big block of metal and has the weight to go with too. At 2.45kg, it feels a bit heavy, but still not to the point where it’s uncomfortable. Thankfully, it measures just 17.5mm in thickness so it easily fits into the laptop compartments of most backpacks. The charger is fairly compact too, so overall, it shouldn’t occupy too much space in your bag. 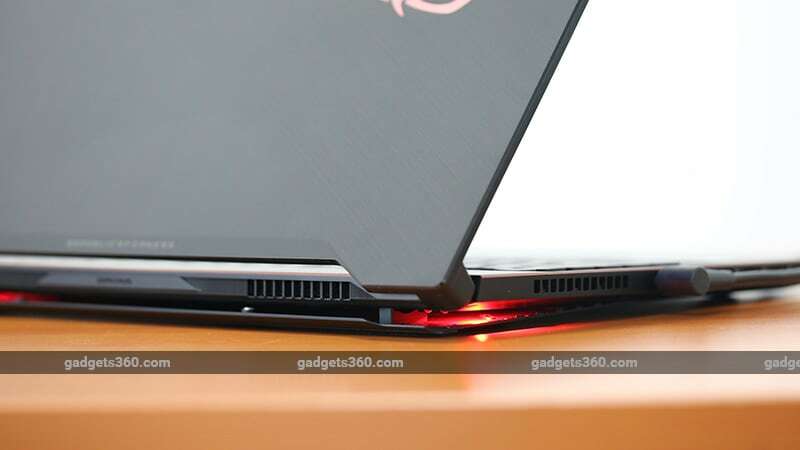 The metal body makes this laptop incredibly sturdy and there’s a really neat dual-tone brushed metal finish on the lid along with a backlit ROG logo. 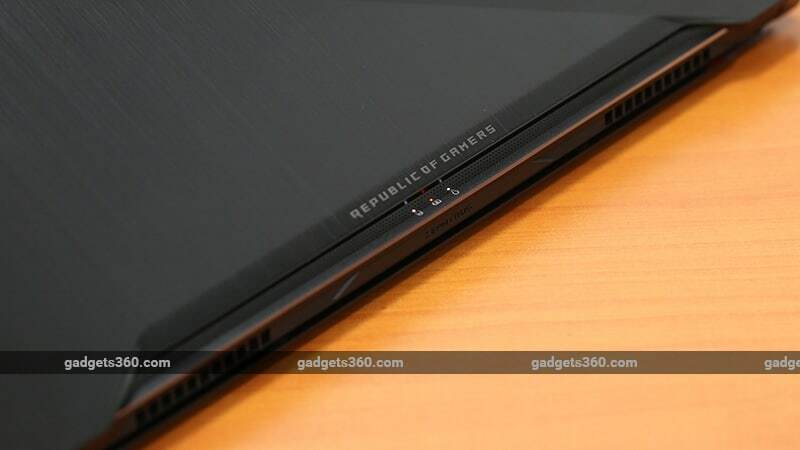 The outer edge of the base also has a copper-coloured chamfered edge, which gives the laptop a premium look. However, the coolest feature only presents itself once you open the lid. The bottom rear of the laptop opens up to form a giant air vent. This also gives the chassis a slight incline, resulting in a better angle for typing. The vent is used to increase air intake, so the fans don’t have to work overtime trying to cool the components. It’s a simple yet brilliant idea to solve the biggest issue with thin gaming laptops, which is fan noise. Asus has thrown in two red LEDs on either end as well, adding to the cool factor, but these can be switched off if needed. The dual hinge design does a good job at holding the lid steady in pretty much any position. We could have used thinner borders around the display but that’s not a dealbreaker in any way. The webcam sits in the correct place on the top, and below the screen, we have another chrome ROG logo. The 15.6-inch full-HD display has a matte finish and good brightness. Colours and viewing angles are good too, thanks to the IPS panel. It also supports a 144Hz refresh rate, 3ms response time (grey to grey), and Nvidia’s G-SYNC. The latter is a feature that’s missing in MSI’s offering. The Zephyrus M has a full-sized chiclet-style keyboard, complete with a numerical pad. We found the spacing between the keys to be good and the direction keys are grouped separately from the rest. Key travel is comfortable and they aren’t noisy at all, which is good when using this laptop in a quite place such as an office, or when gaming at night. There are dedicated buttons above the keyboard for volume adjustment, muting the microphone, and launching Asus’s ROG Gaming Centre program. The trackpad isn’t particularly large but it is wide. The tracking is incredibly smooth and accurate, and this is easily one of the best we’ve come across on a Windows laptop. Sadly, you don’t get individual left and right mouse buttons, which is disappointing for a gaming laptop. You get a good selection of ports, including one HDMI, three USB 3.0, one USB 2.0, a Type-C Thunderbolt 3 port, and a headphones and microphone combo 3.5mm socket. The power inlet is placed on the right, just beyond the exhaust vent, which isn’t the best place as the power cord tends to get a direct blast of the hot air. The status LEDs for power, battery charging and hard drive activity are placed at the edge, above the keys, and are visible even when the lid is closed. In the box, you get a 230W power adapter and that’s pretty much it. As we stated earlier, Asus sent us the top-end variant. It ships with an Nvidia GeForce GTX 1070 graphics card with 8GB of GDDR5 video RAM. However, surprisingly Asus has not used Nvidia’s Max-Q optimisations. This means that you don’t have to compromise on clock speeds. The CPU used here is a hexa-core Intel Core i7-8750H and with it, you get a single 16GB stick of DDR4 (2,666MHz) RAM, which can be expanded up to 32GB. For storage, you get a 512GB M.2 PCIe SSD, along with a 1TB Seagate FireCuda (5400rpm) mechanical hard drive, which has its own flash memory cache for better performance compared to a standard mechanical drive. Like most slim laptops, there’s no quick-release hatch on the bottom for swapping out components. Other specifications include dual-band Wi-Fi 802.11ac with 2x2 MIMO antennas, Bluetooth 5, two bottom-firing 3.5W speakers, and a 4-cell 55WHr battery. The Zephyrus M ships with Windows 10 Home and some third-party apps including a trial version of McAfee LiveSafe security app, along with many of Asus’s own programs. There’s ROG GameVisual for changing the display’s colour profile; Sonic Radar 3, which lets you use a visual overlay to represent enemy fire in compatible games; Sonic Studio 3, which lets you tweak and set audio preferences for individual apps; and Aura for customising the lighting of the keyboard. The keys on the keyboard don’t have per-key RGB lighting but there are four customisable zones. 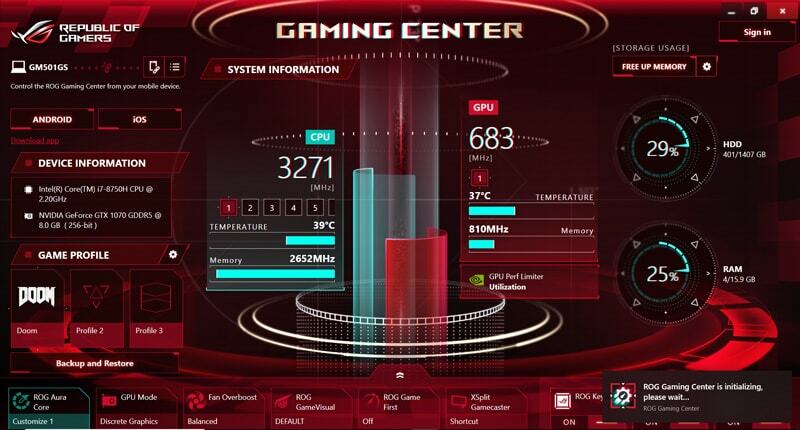 All of the above Asus apps can be launched through the ROG Gaming Centre software. The program has an unnecessary complicated design, which makes it tough to find what you’re looking for at first. It shows you the CPU and GPU temperatures and speeds, as well as the hard drive and RAM usage. You can set shortcuts to launch up to three apps with custom lighting, fan profiles, display colour profiles, etc. 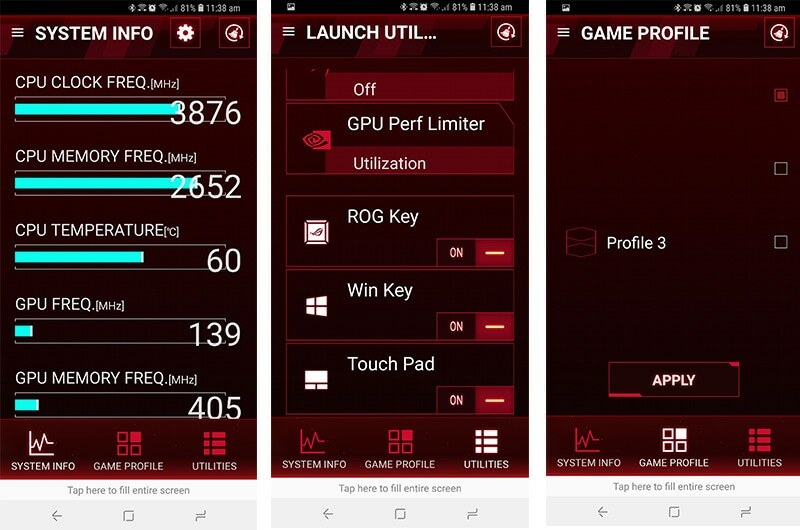 You can also monitor the system state through the ROG Gaming Centre app, for Android and iOS. However, the design is a little clunky, and the text and graphics don’t always line up properly. Asus also gives you the option to switch between G-SYNC and Optimus, which is thoughtful. Both are Nvidia’s technologies but due to the way they work, cannot be enabled together. G-SYNC synchronises your display’s refresh rate with the framerate that the GPU is pushing out, thus avoiding stutter and screen tearing. However, for this to work, the display needs a direct connection with the discrete GPU. For Nvidia’s Optimus technology, the display is connected to the CPU’s integrated GPU, which is how the discrete card can be powered down when not needed, thus improving battery life. With the Zephyrus M, there are two physical connection to the respective GPUs and a system reboot is needed when switching between modes. We used the Zephyrus M in G-SYNC and Optimus modes intermittently, and as expected, it runs a lot cooler and quieter in Optimus mode. Since the discrete GPU is dormant most of the time, the fans don’t need to work too hard, but in G-SYNC mode, you can hear them spinning lightly even when you aren’t running any heavy apps. Fire up a game in either mode though, and the fans begin to sound like mini turbines. Despite having a large air vent at the bottom, they have to work pretty hard to keep things cool, which makes them quite noisy. General performance is very good. We didn’t have any trouble with juggling between multiple open apps, and even resource hogs like Chrome ran just fine with more than 15 tabs open at once. It doesn’t take long to boot into Windows either, and tasks like video encoding and 3D rendering are snappy thanks to the multi-threaded, six-core CPU. Memory bandwidth could have been better, had Asus used two 8GB RAM sticks instead of a single 16GB stick. The Zephyrus M delivers very good gaming performance, and thanks to the standard GeForce GTX 1070 GPU, we managed to get slightly better scores on average when compared to the MSI GS65 Stealth Thin. Other than synthetic tests, the laptop also delivers very good performance in real-world gameplay. We disabled G-SYNC during benchmarking to avoid any bottlenecks, but during actual gameplay, had it enabled. In Rise of the Tomb Raider, we averaged about 63.43fps in the in-game benchmark with all the settings maxed out. Deus Ex: Mankind Divided is a taxing game but the Zephyrus M managed to average close to 40fps with the Ultra preset, and with anti-aliasing set to 2x MSAA. We had similar results with Metro: Last Light, in which we got 63fps on average with the graphics set to Very High and tessellation set to Normal. Doom was cakewalk for the laptop, and with the Ultra preset, we averaged 73fps during actual gameplay. In GTA V, we got 63fps on average with all the graphics quality sliders pushed to the max. The Witcher 3: Wild Hunt, which is slightly old but still taxing, gave us an average framerate of 51fps. We also ran the official Final Fantasy XV benchmark, which gave us a score of 5,841, which is classified as “Fairly High”. G-SYNC seemed to do its job fairly well, and we didn’t encounter any stutter or screen tearing even when the framerate occasionally dipped under 60fps. The display runs by default at 144Hz and there doesn’t seem to be a way to change it (not that you’d want to). As a result, games feel fluid and snappy. The audio from the stereo speakers is good too, and the volume gets quiet loud. When using G-SYNC, which keeps the discrete GPU running, battery life is often below average. Even with regular browser usage and watching a bit of video, we struggled to get more than two and half hours of runtime. In Optimus mode, things get slightly better, and we typically managed to use the laptop for 40-50 minutes longer with similar usage, but this is still quite short. When using Battery Eater Pro, which is the program we use to test the battery life of laptops, the Zephyrus M surprisingly lasted for 1 hour and 38 minutes in G-SYNC mode, and 1 hour and 47 minutes in Optimus mode. Asus has managed to whip up a very competitive offering that pretty much checks all the right boxes. The icing on the cake is the pricing, which is Rs. 1,99,990 in India according to Asus. For Rs. 10,000 more than MSI’s GS63 Stealth Thin 8RF, you get a G-SYNC display, an additional 1TB of storage, and a standard GeForce GTX 1070 instead of the Max-Q option. This laptop also doesn’t run too hot, which is great, but there’s still no escaping the annoying fan noise. The only major drawback here is the short battery life. Asus also sells a lower-end version of the Zephyrus M priced at roughly Rs. 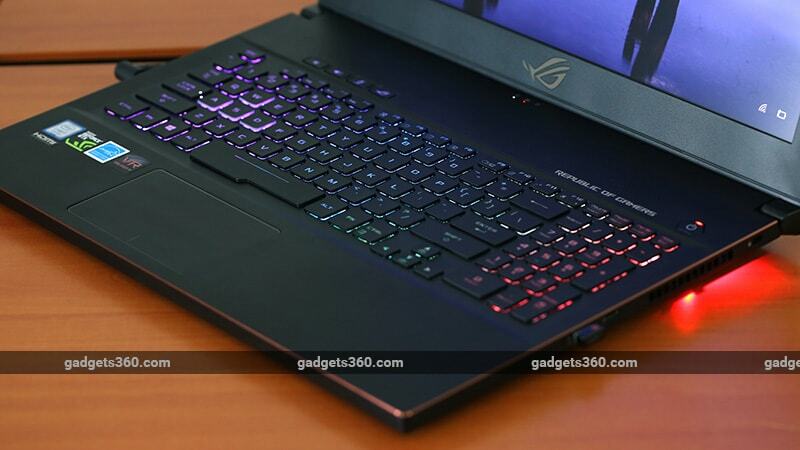 1,59,990, which has the same core features and two-year warranty as the top-end model, but the SSD capacity is 256GB and you get a GeForce GTX 1060 GPU instead of the GTX 1070.
product The Asus ROG Zephyrus M offers powerful components in a slim form factor. But is the performance worth the price? Read our review to find out.